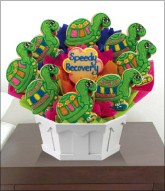 Our hand-made, specially decorated cookies are designed into eye-catching bouquets to make all holidays and occasions a bit sweeter with each bite. 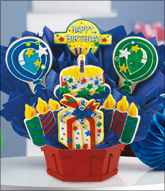 Our famous Cookie BouTray™ is an arrangement of uniquely decorated sugar cookies surrounded by a delectable array of mouth-watering gourmet cookies. 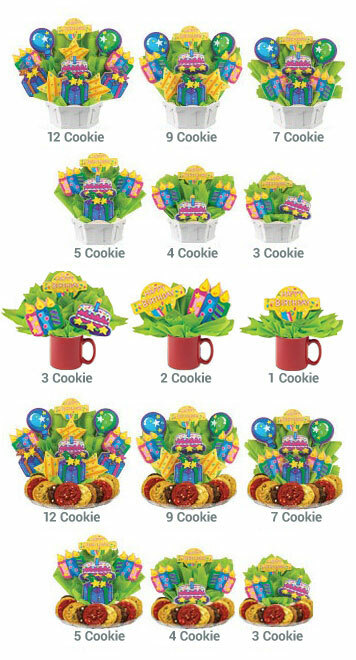 Our wide variety of cookie baskets are filled with delicious gourmet cookies with your choice of themed decorated cookies to top it all off. Our freshly baked assortment of gourmet cookies come in a variety of tasty flavors such as chocolate chip, red velvet, white chocolate macadamia nut and many more! 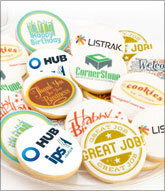 Any of our arrangements containing message cookies can be changed to display the message of your choice! 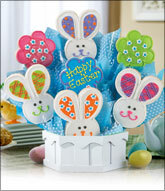 Add a personal message for your recipient. 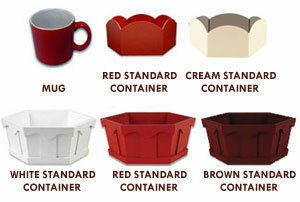 Each product comes in a variety of sizes and price ranges to suit your cookie-giving needs. 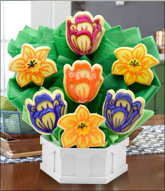 Choose the cookie bouquet container that compliments your selected arrangement.